Quite the scoop for Bleeding Cool. Here’s a video, that’s just over 3 and a half minutes of Dan DiDio, Jim Lee, Grant Morrison and others talking excitedly about September’s 52 series debuts. It doesn’t reveal anything new, apart from a few seconds of Lee sketching, but I must say, their enthusiasm for the bold move is infectious. Here’s a look at the evil (and articulated) alternate version of The Reverse Flash, otherwise known as Professor Zoom. He can be yours in August, or next month at San Diego Comic-Con. Official details below. This summer, the bestselling series FLASHPOINT has taken the comic book world by storm. In August, four FLASHPOINT action figures (manufactured by DC DIRECT) will be shipping to retailers. And if you’re heading to San Diego next month, you’ll want to pay very close attention:San Diego Comic Con is the only place where you’ll be able to complete your FLASHPOINT action figure collection. Head over to the Graphitti Designs Booth (#2315) for your chance to purchase an extremely limited DC DIRECT action figure of one of FLASHPOINT’s central villains: Zoom. Zoom stands approximately 6.5” inches high, features multiple points of articulation and includes a removable display base. But don’t wait too long! Due to its rare availability, attendees will each be limited to only one Zoom figure each. 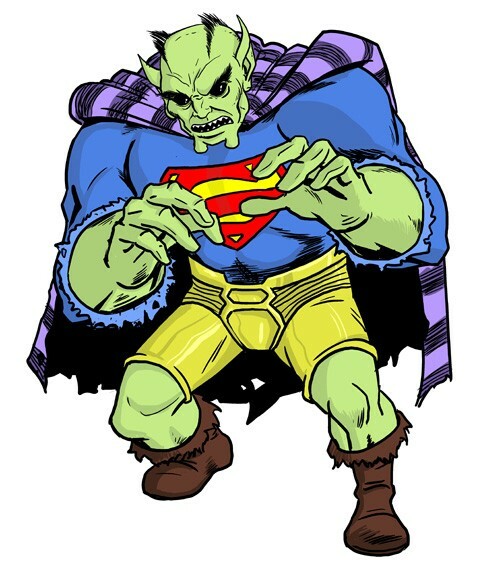 Comics Alliance has a great post featuring 19 different evil Supermen (and some women and boys). Yes, there’s some whacky Superman-centric villains from the Man of Steel’s past, but artist Culver makes them all look great. 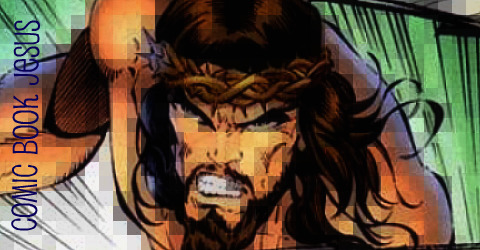 Below are three of my faves – The Negative Superman, Draaga and Saviour. See the rest here and Culver’s great art blog here. 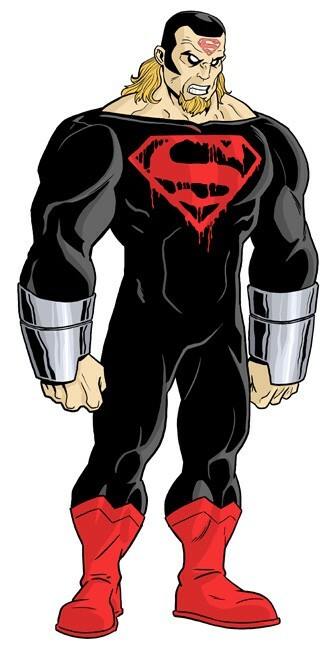 I bet Culver could even make Superman’s new underwear-less, armoured costume look good. Cool. Brad Bird (Iron Giant, The Incredibles) directs his first live action film with this fourth instalment of the Mission Impossible franchise. Tom Cruise returns as Ethan Hunt, and brings his usual jumping, running and serious talk with him. Simon Pegg also comes back, after showing up as geek support in the excellent MI3, although seeing him here as an action man field agent looks a bit odd. Ving Rhames returns too, and Lost’s Josh Holloway, and The Hurt Locker’s (and The Avengers’ Hawkeye) Jeremy Renner also help round out the cast. Cruise looks like a DJ in the freeze frame above. It opens on December 16. Roger Langridge has garnered many fans with his accessible work on Thor: The Mighty Avenger and BOOM!’s Muppet Show. Working with the latter publisher’s Kaboom! imprint, New Zealander Langridge again shows what comics can, and should, be – easy on the eyes, easy to understand and most importantly – fun. There’s an insightful interview with the writer/artist about this new monthly series here, in which he reveals how he’s inspired by the kind of lunacy seen in Monty Python and The Goon Show. 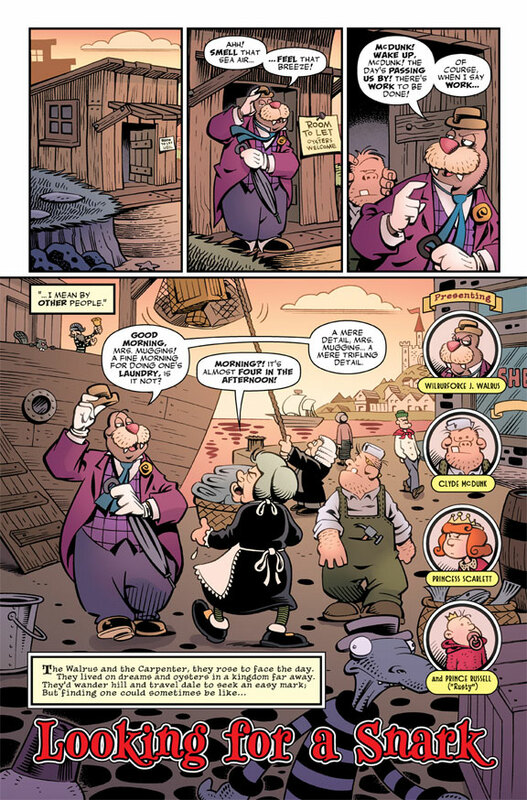 Using Lewis Carroll’s The Walrus and The Carpenter characters from the 1871 Alice in Wonderland sequel, Through The Looking Glass, and giving them the spotlight certainly is an unusual premise for an ongoing series, but this has great dialogue, zany adventures and a general sense of playfulness on every page. Wilburforce J. Walrus is arrogant, ignorant of the needs of others and quite full of himself, but Langridge makes him a likeable lead. With his trustworthy and dim offsider, McDunk (The Carpenter, obviously) in tow, the pair head off to the King’s castle, upon learning that he’s just left for a 3 month journey. Pretending to be Princess Scarlett’s ballet teachers, they dance their way in and then form another lie by claiming to be looking for the dreaded creatures known as snarks within the royal walls. While Scarlett, and the baby Prince Rusty follow Walrus and his wild claims of the snarks, he seizes the moment and steals food. 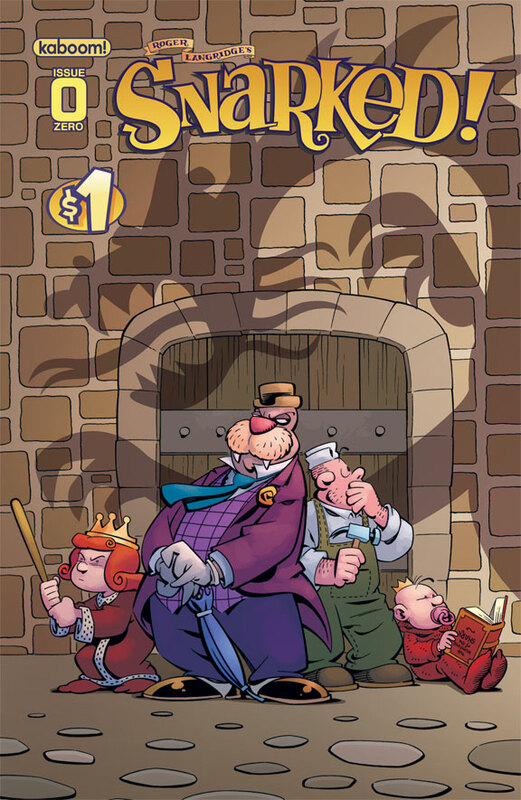 As it’s a #0 issue, it acts like a primer, with fewer story pages ( only 8 ) and more back up pages, including character sketches, a 2 page excerpt from Scarlett’s diary (oddly enough, recounting the events that we’ve just read), The Hunting of the Snark, and the original Walrus and The Carpenter poems by Carroll, plus puzzles and games. It’s only $1, so is a bargain for an entertaining tale that both adults and kids can read, and if it introduces more people to the works of Lewis Carroll, even better. The art is loose, but not sketchy and the setting, the character designs, body language and timing all add to the comedic charm. The only nitpicks I have are that, in Scarlett’s diary she mentions that her father has been on his voyage for, “three months, twelve days,” and The Walrus and The Carpenter visited her on the same day. However when we see The Walrus reading the newspaper in the main story, it states that the king has just left for an expected three month voyage, so either the newspaper is wrong and he left 3 months ago with another 3 months left, or Scarlett doesn’t know how to use a calendar. Yes, nitpciky, but noticeable. The other odd moment is when The Walrus, while in the castle, notices a golden statue of the king and becomes greedily transfixed by it. 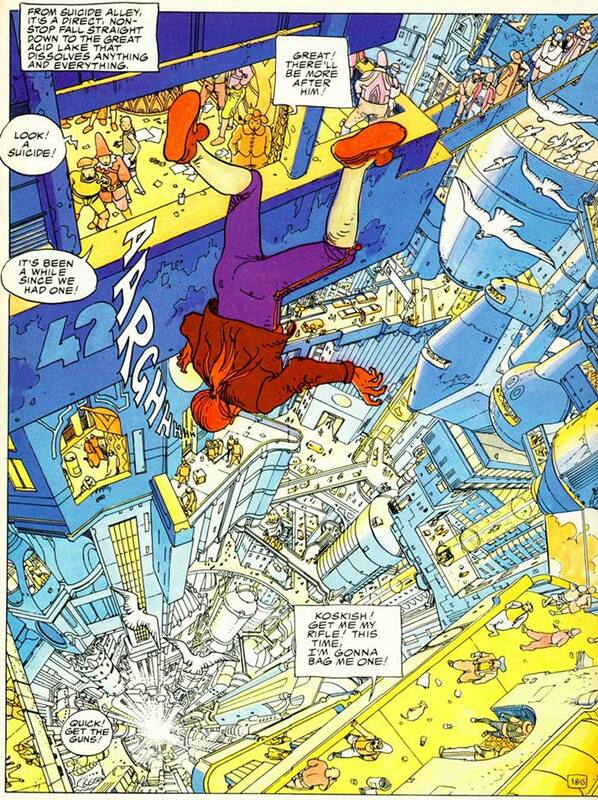 On the next page, both he and McDunk are being chased out by soldiers. 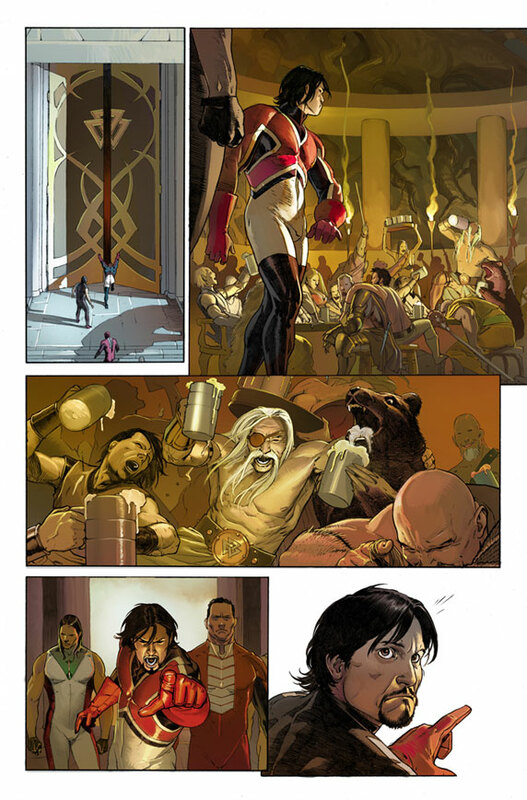 The implication of course is that The Walrus tries to steal it, but if there was an extra panel of him attempting to stuff the statue into his bag while being watched by angry guards, the transition between panels would work better. Snarked #0 is released in August and can (and should be) be ordered now, and the series kicks off with the #1 issue in October. It’s an awkward title, but it has pretty art. Text-free preview of the August releasing debut below. 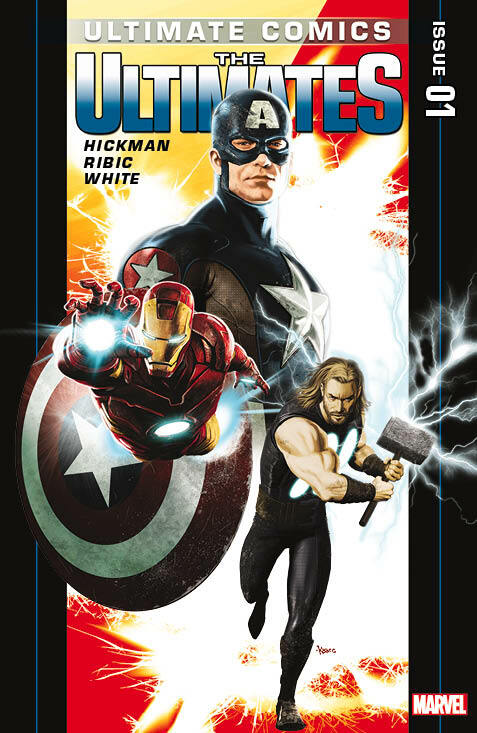 Marvel is pleased to present your first look at Ultimate Comics Ultimates #1, from the critically acclaimed creative team of Jonathan Hickman and Esad Ribic! 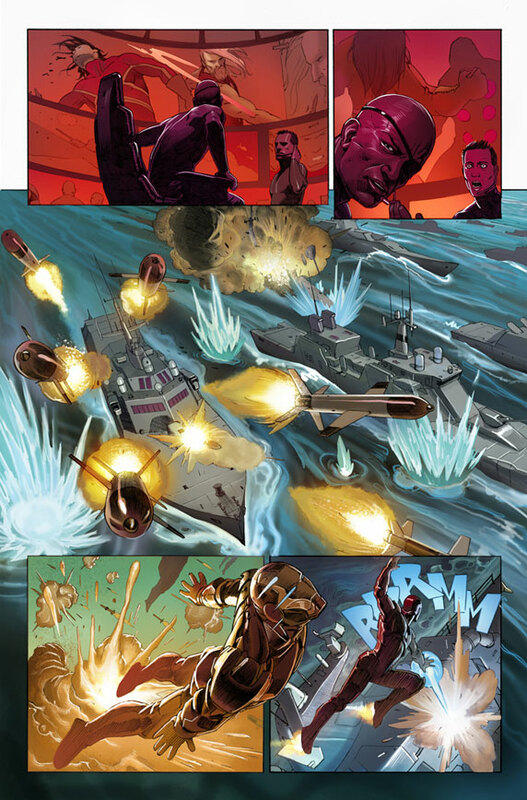 Iron Man, Hawkeye, Nick Fury & Thor are back together after the monumental events of Ultimate Comics Fallout! 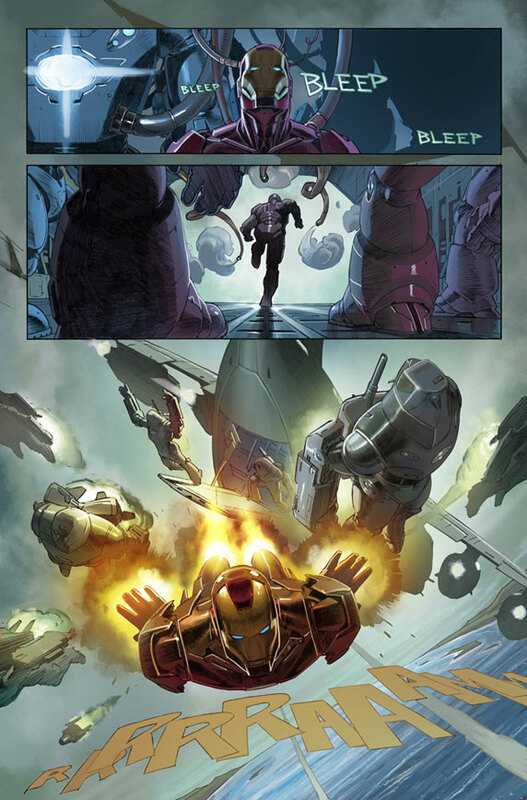 One of the biggest villains that ever faced the Ultimate Universe has returned. But with a teammate out of action, can the remaining members save the world as they struggle to find their place in the Ultimate Universe? 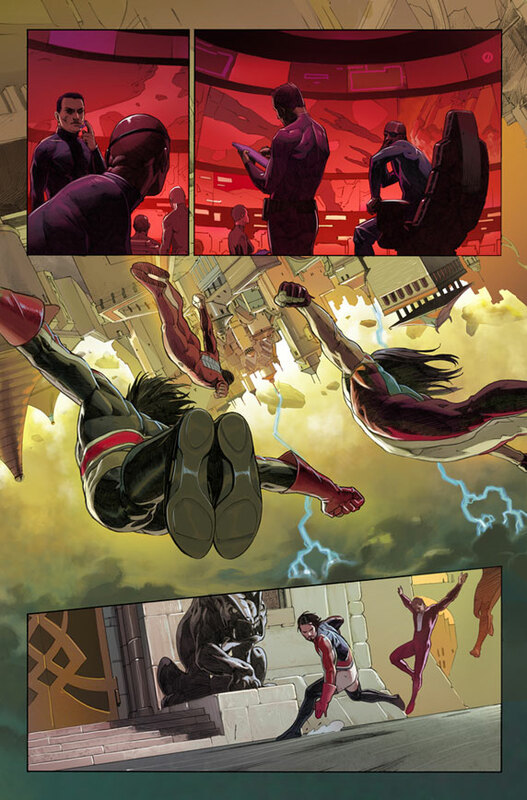 Ultimate Comics Universe Reborn kicks off this August in Ultimate Comics Ultimates #1! Good news below about a new regular contributor to Broken Frontier, a great comics site that, yes, I sometimes write for. Broken Frontier is proud to announce that Joe Keatinge has started a new weekly column at the site, titled One You Want. Each Monday, One You Want declares its love for a creator-owned, international or otherwise unsung comics gem that hits stores that week, and tells you why you should go get it first chance you get. “I constantly feel a lot of the most brilliant comics get swallowed up in the PR machines of the larger companies, so I’m using the spotlight Broken Frontier has handed over to me to do my part in making sure they have a fighting chance in this ever fiercely competitive industry,” Keatinge says. Joe Keatinge is the Eisner and Harvey award-winning co-editor of POPGUN and writer of the upcoming Image Comics series, BRUTAL, with illustrator Frank Cho. For the column’s first installment, Keatinge looks at Humanoids Publishing’s INCAL: THE CLASSIC COLLECTION, written by Alejandro Jodorowsky and illustrated by Jean “Moebius” Giraud. Go read it here. Established in the fall of 2002, Broken Frontier (www.brokenfrontier.com) quickly built a solid reputation for its extensive, unique, and critical coverage of the comic book industry. Coverage includes headline news, interviews, articles, reviews, columns and blogs. The website covers every corner of the comic book industry, from mainstream to independent publishers, from print and digital publications to film and tv adaptations. Additionally, Broken Frontier is the publisher of the first digital comic book magazine for mobile devices, The Frontiersman.